Southern California’s highways are some of the world’s busiest, and large trucks are a common sight here. If you’re injured in an accident with a large truck in southern California, your chances of sustaining a serious injury will be far greater than if you are in a typical accident between two automobiles. Call San Bernardino truck accident attorney Chris Purcell right away. Chris has been representing truck accident victims for more than two decades. He will work hard to hold the guilty accountable and to obtain the compensation and justice you need. WHAT ARE THE COMMON CAUSES OF TRUCK ACCIDENTS IN SAN BERNARDINO? This is not an all-inclusive list of causes of truck accidents. If you have been injured because of a truck driver’s negligence, speak to experienced lawyer Chris Purcell to discuss your available legal options right away. The trucking industry is heavily regulated by the federal government, but unfortunately, that is still not enough to prevent all truck accidents on the roads. Drivers and employers must follow the federal government’s regulations and if they are found to be in violation of any of them, they may have to pay a hefty fine. Drivers must take at least a thirty minute break after completing the first eight hours of driving for the day. Federal regulations also mandate that no driver should be driving on the road for more than 11 hours per day, or a total of 70 hours per week. Driver fatigue is one of the leading causes of truck accidents. If you were injured because of a drowsy driver and it is discovered the employer overscheduled the driver, you may be eligible to receive compensation from both the driver and the employer. Employers are also required to invest in employee training to make sure all drivers are capable of handling trucks under any driving condition. On top of the initial training that occurs when drivers are hired, employers should also hold frequent refresher trainings to help drivers learn new skills. Companies are responsible for monitoring and evaluating each driver’s performance while on the road. If there are performance issues, they should be addressed promptly with the employee instead of ignored. If a driver receives a speeding ticket or any kind of traffic ticket, the employer should be notified so they can launch an investigation into the driver’s performance. Unfortunately, these regulations are not enough. There are still truck accidents on the roads across the country, leading to serious and often fatal injuries. If you have been injured in a truck accident, speak to attorney Chris Purcell as soon as possible to discuss your legal options. Adopting a normal sleeping schedule so they can always be rested prior to a drive. Each driver should get at least seven hours of sleep per night, preferably during the night, where they are more likely to get a restful sleep. Drivers should always pull off of the road when they feel tired to take a nap. The most effective naps are between 10 to 45 minutes. This is enough time to make you feel restored, alert and ready to hit the road again. It is also a more effective way of waking up than drinking caffeine or taking stimulants. Eat a balanced diet. If you don’t eat properly, you may experience issues with your blood sugar, which may lead to driver fatigue. Refrain from taking any medication that could cause drowsiness before you begin a drive. If you have been injured in a truck accident as a result of a negligent truck driver, call today to skilled lawyer Chris Purcell immediately following the accident. 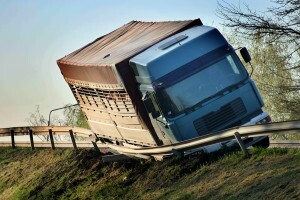 HOW CAN A SAN BERNARDINO COUNTY LAWYER HELP AFTER A TRUCK ACCIDENT? For drivers and passengers in automobiles, injuries sustained in a truck accident can be catastrophic if not fatal. In the U.S. in 2012, approximately 333,000 large trucks were involved in traffic collisions resulting in 104,000 injuries and 3,921 fatalities. That’s more than ten deaths every day. Chris Purcell handles truck accident cases routinely. He will compile logs, reports, and other evidence, examine witnesses, and even call on truck and accident experts to provide evidence and testimony on your behalf. A comprehensive investigation is essential to determine precisely what happened and what party should be held accountable. Two decades of investigative experience have taught personal injury lawyer Chris Purcell that the most common causes of truck accidents are driver fatigue, speeding, improper loading, improper maintenance, and unlicensed or improperly trained drivers. San Bernardino truck accident lawyer Chris Purcell’s goal and desire is to make sure that you get the full amount of compensation you deserve for your injuries, lost wages, medical bills, pain and suffering, and property damage. If you’ve been injured in a trucking accident, your ability to work may be temporarily or permanently impaired. The medical, financial, and personal challenges you confront may seem overwhelming. Personal injury attorney Chris Purcell is committed to helping you get your life back on track after a serious truck-related injury and helping you move forward in the most positive and constructive way possible. Chris represents clients throughout southern California in cases involving pedestrian accidents, motorcycle accidents, truck accidents, dog bites, bicycle accidents, premises liability, defective products, and slip and fall accidents. All personal injury claims are handled on a contingency fee basis, so you pay no fees unless and until Purcell Law recovers compensation for you. To schedule a free consultation with an Inland Empire or San Bernardino truck accident attorney, please call our offices at 714-884-3006 or contact Chris by email today.